Wanda Stapp and Marilyn McCormick as dear, sweet, murderous aunts Abby and Martha in the Ferndale Rep production of Arsenic and Old Lace. "A play was like a watch that laughed." So wrote theatre critic Walter Kerr, describing the mechanism of Broadway comedies of the ’30s and ’40s, like The Front Page, Room Service, You Can't Take It With You and the 1939 play now on stage at Ferndale Repertory Theatre, Arsenic and Old Lace. Situations and relationships get wound up tighter and tighter in the first act, and fly apart in the mayhem of the second. There are typically lots of characters and several simultaneous disasters-in-progress. Arsenic and Old Lace is best known today for the movie version starring Cary Grant and directed by Frank Capra, but the play was a Broadway hit during World War II, running for three and a half years and 1,444 performances. Several of the actors in the original cast are also in the movie: Josephine Hull and Jean Adair as the maiden aunt sisters, and John Alexander as nephew Teddy Brewster, who believes he is really Teddy Roosevelt. The movie is pretty faithful to the play, with a few added cinematic scenes and differences in detail. The play (the only success of Kansas playwright Joseph Kesselring) begins in a more leisurely fashion, with one of the elderly aunts serving tea in the front room of a solidly traditional Brooklyn house, to her neighbor, Reverend Harper. It's clear that the aunts are beloved for their cheery charity, but the Reverend is troubled by the romance between his daughter, Elaine, and another nephew, Mortimer Brewster. He objects to Mortimer spending so much time in certain unseemly places. That's his job: Mortimer is a theatre critic. But the sedate witticisms of this scene constitute the only quiet moments of the play. The young lovers, Mortimer and Elaine, sweep in and announce their engagement, but after Elaine goes, Mortimer learns that his aunts have expanded their charity work: They've been bringing peace to lonely old men by poisoning their elderberry wine and burying them in the cellar -- with an appropriately prayerful funeral service. Further complications ensue, principally generated by the sudden appearance of a third nephew, Jonathan Brewster, the black sheep who returns as an international criminal looking for a hideout, and a place for his faithful plastic surgeon companion, Dr. Herman Einstein, to give him yet another new face. The one he's currently wearing reminds people of Boris Karloff (the famous Frankenstein), which enrages him. In the Ferndale production, director Renee Grinnell has the story and the cast moving briskly across the handsome set, though there is so much going on that the play pushes the clock to two and a half hours, with intermission. Several of the performances are reminiscent of the movie: Wanda Stapp has the same sweet charm (if not the same funny walk) as Josephine Hull playing Aunt Abby, Steven Fontain is an even more political cartoonish Teddy than the movie's John Alexander, and Evan Needham sneaks in some Peter Lorre notes as Dr. Einstein. Lexus Carlton Landry as Jonathan is even more menacing (with a deliciously chilling laugh) than Raymond Massey in the movie, and Marilyn McCormick as Aunt Martha has no comparison -- with her authoritative voice and the rapturous and murderous gleam in her eye, she ups her auntie. Sam Cord has the most difficult role as Mortimer, and it is his energy, clarity and physicality that propel the play forward. He doesn't quite have the expressions and moves of Cary Grant that made the movie so funny, but then, who does? Brittany Gonzales (Elaine), Samuel Dallas McComber (Rev. Harper and Lt. Rooney), Tom McCarthy (Mr. Witherspoon), Neal Schoonmaker (Officer O'Hara) and Denim Ohmit (Officer Brophy) contribute to this competent production. In fact, the clockwork machinery tends to obscure just how weird this play is: Part romance, part thriller, it's a macabre comedy with the mechanism of farce. Even Frank Capra couldn't settle on a consistent style for it. The moral ambiguities at the heart of it are never quite dealt with, though the pieces are there. Too many gears may be going for one evening, but Ferndale fans will find some laughter in the old machinery yet. 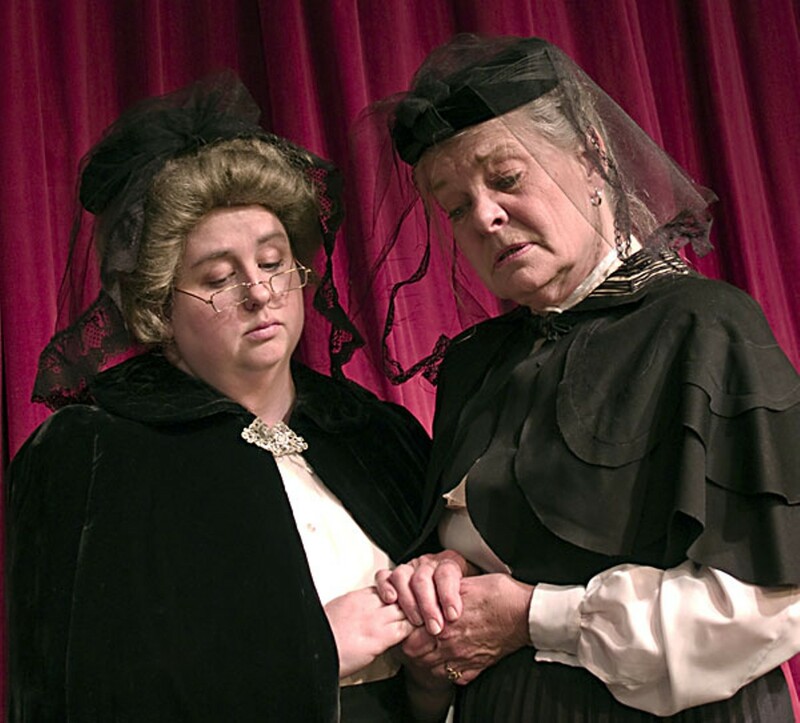 Arsenic and Old Lace is at Ferndale Rep for only two more weekends: June 5, 6, 12 and 13 at 8 p.m. with Sunday matinees at 2 p.m. on June 7 and 14. Incidentally, though there are funny lines about theatre and critics in this show, for my money the funniest play with critics as characters is still Tom Stoppard's The Real Inspector Hound. Coming Up: The second-year students of Dell'Arte International's MFA program present Tell Me A Story, an evening of participatory storytelling, Thursday through Sunday, June 4-7 at 8 p.m. in the Carlo. Looking forward, Dell'Arte kicks off the annual Mad River Festival on June 20 by presenting a Lifetime Achievement Award to stage and screen actor Rene Auberjonois, in a ceremony followed by festivities (featuring The Joyce Hough Band and Joanne Rand) in the Rooney Amphitheatre beginning at 8:30 pm.